I've written about my love for this area several times here, but we are moving here knowing that there are disadvantages to living in a fairly small village in a fairly rural area. We spent the last year roaming all around France and Switzerland, even briefly considering moving to the U.S., before deciding that this area was the one for us. The weather is beautiful about 90% of the time, the locally produced food is gorgeous, and the pace of life is still quite tranquil. Another factor is that, compared to Switzerland, the cost of living in France overall (at least outside of Paris) is quite a bit lower. Switzerland is a fantastic place to live - but it helps if you are employed by a company that pays a lot of your required expenses - they pay part of your social security, part of your insurance (though health insurance is paid for by individuals) and so on. If you are self-employed or run a small company (that's us), you have to foot the bill for all of that yourself. Zürich is a great city, but rents are high and buying a house is simply way out of our budget. And food, including eating out, is quite expensive. Here we can eat very well for a lot cheaper. Sure, the nearest Japanese grocery store is a 2 hour drive away in Lyon (we do have some 'Asian' stores that are a bit closer though), and for many ingredients I may even have to go to Paris or ship a lot of stuff back from Japan - but overall, I think it's going to work out. Of course we are able to make such a move since both of us do most of our work via the internet. So, how is my move going to affect Just Hungry or Just Bento? In the long term I think it's going to make them even better. I do have an urge to chronicle my new life the Provence somewhere, including a lot of non-food things, and I'm not sure yet if I should do it here or set up a new blog for that purpose. But just in terms of food I know that the access to the abundance of produce here is going to re-inspire me to cook more. And, with the reduced living costs, I hope to be able to make a lot more trips back to Japan too. (As a sidenote, one of the reasons we decided to settle here is to have a place where my mother can come and relax for a few weeks every year, away from the daily big and small stresses she seems to experience in Japan, which may have caused her health to break down.) And I'll be going to the U.S. quite a bit too, for business and family reasons - including some promotional activities for my book (more about that in another post). In the short term, it's going to be interesting. Right now the house is kind of habitable - there's electricity, and we got the ADSL working (which, in our household, is slightly more important than running water and a toilet that flushes). There's hot and cold running water and we managed to clean up one of the old toilets enough to use. On the other hand, it has no kitchen! We've been surviving on bread and cheese and eating out at local restaurants so far, but we're planning to get a small refrigerator and a hot plate or something to get by until we can start the renovations on the house. (We stupidly managed to forget that getting workers in is pretty much impossible in France in July-August.) So...until September at least, I'll be doing a lot of non-cooking-cooking I think. Should be um, fun? We'll see. It will certainly be a challenge! Physically that is...mentally or metaphysically I'm not sure. But anyway, the town we selected as being just the right combination of factors is Vaison-la-Romaine, in the north-eastern area of Provence called the Haut Vaucluse - the upper or northern part of the department of Vaucluse, which in turn is in the north-western part of the PACA (Provence-Alpes-Côte d''Azur) region. It seemed right to us from all the other places we considered; the town is not too rural (it is the center of commercial activity in the area and has a big, weekly market and some great local shops) but not too urbanized. It is quite touristy, as is most of the Provence, but not as overrun as many other places (yet) - and it's occuped by more year-round residents than summer-home-residents. It's not too far from Lyon-Saint Exupéry, an international airport with not-too-bad connections to the rest of the world. And it's a fairly easy day's drive away Zürich, a critical factor since The Guy needs to be there for meetings and stuff on occasion. That's the view from one of the windows. The haute-ville or "upper town" is to the left, on top of the hill, and is mostly Medieval with some buildings dating back to the 13th century. The Roman bridge, built in the 1st century A.D., spans the Ouvèze river, and to the right is the basse-ville or "lower town", which has most of the shops and restaurants, and has so many Roman ruins that local people barely glance at them. In front of the house, across the Ouvèze, is a rocky cliff with a statue of the "Black Madonna" on top, and to the right is a view of Mont Ventoux, the biggest peak in the area and a famous challenge on the Tour de France. So, the house has a few issues. As I mentioned earlier, it has no kitchen at the moment. It has one sort-of working bathroom , which was absolutely filthy when we got here, and will need replacing since the toilet is cracked, the shower stall seems to be falling apart, and so on. The other bathroom has no water. There's a big, deep hole in the ground on one side of the house, which needs to be dealt with before a small car or child falls in there. 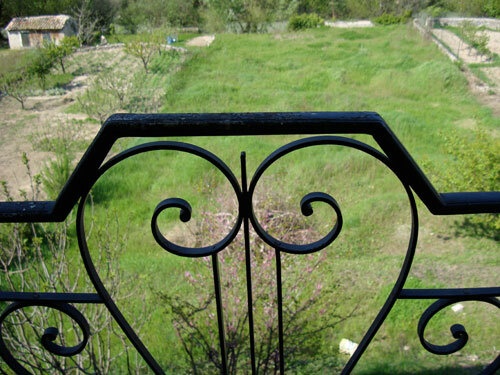 We have a fair sized, completely overgrown garden, that leads right to the banks of the Ouveze...but at the moment it's only accessible from the house via a steep, rocky dirt path. The road in front of the house gets a busy during the day, and already we've had to shoo away some Belgian tourists who parked right in front of the front door so we that could barely get in. The basement/cellar, which is actually built into the rock, used to be a studio apartment, in which a slightly odd single guy lived apparently (I can't imagine any human being living there full time) - it's almost pitch black in there unless the door is held wide open, and perpetually chilly (good for wine...not so good for people) so let's say at the moment it's mighty spooky. I'm not sure if we have enough money to do all the renovations that the house really needs. This keeps me up late at night more often than not. If you've made it this far, a question for you - would you prefer to read stuff about my new life in France (with lots of non-food things) right here on Just Hungry, or would you prefer that to be separate, perhaps in a new blog? Just curious - and no promises as to what I'll end up doing yet, since I have no idea myself at this point...in more ways than one. Submitted by maki on 2010-06-07 20:50. First off, congratulations on your new home! It looks like you're in a beautiful area! I think writing about your new life on Just Hungry would be fine! The area is just wonderfull! If I could only speak some frensh it would be a great place to go to on a trip. I too think writing about everythink concerning your new live here on Just Hungry would be fine, but I won't mind if it were elsewhere. That looks like it'll be a grand adventure...if not now, in the experience, at least when you look back on your life when you're old! =D While I wouldn't mind seeing the trials and tribulations of the New House on Just Hungry, I really feel that streamlining a blog's content helps keep things focused. I wouldn't want to see one of my favorite Try This New Recipe blogs turn into just a story blog, unless you balance it really well, or you have a recipe that ties in directly to the rest of the blog post. Well, that's my two-cents! What a great place to be. A little challenge does add to the spice of life. Please feel free to talk about your new home with your planning of the new kitchen, and what you will plant in your garden. Maybe "The Guy" may make an appearance? Congratulations on the new house, and bon courage with your renovations! 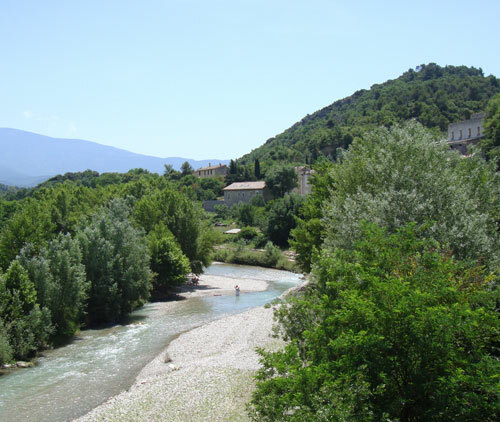 I'll be your neighbor soon; I'm in the process of renovating a village house in Faucon, just near Vaison, and *should* be moving in this August. Looking forward to more posts about your experience in Provence! It's seems that the house you bought has a really "vue imprenable" ! I wish you good luck to do renovations. It will take time if you don't have enough money but I think it would be great once done. If you have some knowledge in renovations it will be cheaper to do it yourself. Wow Maki, it looks amazing! The views are worth it alone. I hope the renovation goes well and you settle in. I always find before moving in is an enourmous stress, but once I'm there things always go smoother. I would love to read about your new life in Just Hungry, you've always managed to keep the balance of home life and food related stuff marvalously well before so I don't see why things should change. Part of the reason I like reading this blog so much is because it feels 'alive' and not just like a recipe book. I think it would be wonderful if you continued to blog about it here - I'm loving reading about Provence! Your new home is beautiful (the views! ), congratulations! I think it's perfectly acceptable to mix in posts about your new adventure in Provence, France along with your food posts. This a blog not just about your food but your life experiences and how food fits in with it all. I'm looking forward to posts about your new home along with your hinted creative cooking posts. Good luck remodeling and trying to remain sane! I for one would love to hear about what you get up to in France on this blog. But, if you choose to start a new one I'll probably follow that too. Don't care where you post as long as you DO! "Justhungry" won't be bento only either way. I think I can say - we're all jealous! I would love to hear all about your new house! It sounds like a wonderful adventure ... and it'd be great to read about somebody else's adventures, they are so much more amusing when they happen to somebody else! Whether you choose a new blog or include the posts in this one doesn't much matter to me. I'll enjoy them either way. totally jealous and would love to read about your renovating/adjusting adventures! 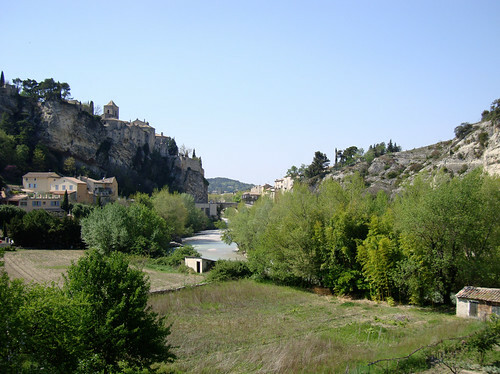 My husband, mother-in-law, and I spent a day in Vaison-La-Romaine and absolutely loved it. Of course this is from the stand point of a Canadian tourist. Regardless, it is a beautiful area (Provence) to settle. A huge "Congratulations" to you and your family on your move. It would be fantastic to read about your Provence adventures on "Just Hungry." Food influences your life and your life influences your recipes. Go for it! I would totally read your adventures. Your house kind of sounds like the "Money Pit," the movie with Tom Hanks. I think there's lot of potential for it. It's all about location, location, location! Bienvenue en Provence Maki! Like everyone else who's written so far, I'd love to hear about your settling in and it sure makes it easier for us to be able to read it on Just Hungry. But Athena makes a good point about keeping a blog focused. I like her idea of tying in a recipe to the story. Another way of avoiding dilution is to have exclusive trials and tribulations stories as occasional "guest" entries, though it's hard to imagine you writing a story WITHOUT some interesting mention of edibles or cooking. Congratulations on your move! Your new house sounds absolutely lovely. I would definitely be reading your adventures there. In my opinion, having a blog just for that might be a better option since you've already defined the scope of your food blogs. Wherever you blog it, I will read it. I'm very much looking forward to reading about your life in Provence. I wish you much luck with the renovations! I think writing about your new life on just hunngry plus your new food experiments/experiences together would be great. I don't follow your blogs themselves all that much, yet. A friend interested me in Bento's recently, and I've used your blogs as mainly a recipe resource for which I wish to thank you. Sometimes, though, I take a look a the current entry before I click on the recipes, and I think it would be wonderful to see entries about Provence, especially pictures. It looks absolutely amazing, the kind of place that us Americans don't see ever, unless we're lucky enough to travel across the Atlantic. I'd love to hear about your adventures in Provence! My preference would be to read about it on a new blog. I feel strongly that "single-minded" blogs are better, especially since this one has a big readership, gained as a result of it being about something they are interested in - Japanese culture and Japanese food. Writing about your life in France would dilute that content, and thus the value of the blog. I definitely think you should start a new one, which I'm sure will be as equally well erad, maybe by a slightly different audience of people who are interested in France, or considering moving there themselves. What I would be interested in reading about here, however, are things that related to your being a Japanese person living abroad - how you adjusted to different cultures and foods, and how leaving Japan has made you feel about your home country. (I am a foreigner living in Japan, hence why I would find this interesting!). Amazing! My husband and I are mega-jealous! I would love to read about your life in Provence on this blog. I came across this site because I am interested in food and cooking, but I follow this blog because I like your writing, your thoughts, and your perspective. It's what make the site unique. Of course, if you choose to start another blog to record your adventure, I will definitely follow that too! I would prefer to read about your new adventures here, actually. Many of your readers (myself included) are constantly going different places -- moving, being citizens of many countries, etc. It'll be refreshing to read about your life in a new country, plus the fun (and challenges) you have cooking Japanese food in rural France. A lot of people here post saying "I can't find Japanese food" or "I live too far away to make anything good" but they forget what local produce has to offer. I look forward to your posts from other countries and areas. I feel that's what makes "just hungry" a great food blog. And unlike many other food blogs, you don't have to scan through five pages and 100 images about someone's children to get to a recipe which you could've found somewhere else! I would love to read about your adventures in Provence on Just Hungry(less blogs to keep track of). Though, I would read yuor posts wherever put them. I am intrigued by your search process - which places you eliminated and why. Congratulations! And here would be just fine. Congrats on the new adventure! I love Provence and i'm sure you'll have an amazing experience there. I used to go there all the time when i lived in London. The quality of the products is good, they ship pretty fast and i think the shipping fees are quite reasonable. I sometimes do group orders ( which i doubt you'll get a chance to do in Vaison but still....). Again, good luck for everything! You're certainly not work shy! We have a house in the mountains of Alicante that originally had no kitchen, nowater except for a well and still only has a generator for power. I know much work will be involved. It's because of this that I'd like to see a dedicated blog with a few food related entries in this one that invite people to go and explore it. I think the current balance you have with the Just Hungry site is perfect (I'm more of a Just Hungry fan than a Just Bento follower). I'm not sure if I would have appreciated all that Just Hungry has to offer if my first encounters were a succession of posts about settling into a European location. Congratulations! And welcome in France, I think your place choice is good, except the lack of japanese ingredients. I would enjoye reading your new adventures here or on a new blog! And you will need a copy of the Petrarch Sonnets to complete your romantic getaway. Wonderful place to watch le tour on le Mont. I'll be interested in how you deal with cooking on a hotplate, since that's what I have -- plus a microwave and a toaster. I live in a basement flat that thinks it's still a laundry room. I can always go upstairs and use the real kitchen --- but I'm old and tired and don't want to climb those stairs any oftener than I have to. So I'm looking forward to some interesting hotplate recipes. So excited for you! And I was touched that one of the reasons you choose your new location was for your mother. Pretty brave. We have a townhouse in Burgundy but it's in fairly good shape. I will be working on the kitchen this summer(if I can scavenge up some workers). Having just discovered your Blog a month ago, I don't have any preferences... I was just happy to get an update on you move. I envy you!!! I was in the south of France about 6 years ago in Bandol and Cannes and I absolutely loved it! Am looking forward to getting information on the transformation of your dwelling. Je suis heureuse d'avoir découvert votre Blogue! Congratulations! How exciting! I already know I'll be living vicariously through you! I wouldn't mind reading about your Provencal adventures on Just Hungry or on a separate blog - I already automatically go to my Just Hungry bookmark, then click on the Just Bento icon, so clicking one more time after that wouldn't be hard at all. :) I feel like you might feel a little more free if you write the Provencal related musings on a separate blog, rather than on Just Hungry, where you may worry about straying from the Japanese cooking. That's just my gut reaction, and as we don't really know each other personally, you can take it or leave it. :) Felicitations and Omedetogozaimasu!! Re: to stay or go? I'm very excited to read about non-food stuff going on with you - the house sounds amazing; congratulations on finding something and good luck with the renovations. I would suggest creating a new blog for non-food discussion. (My Life in Provence-type deal. *) I tend to like things organized/compartmentalized, and I imagine most of your readers would happily click away from here to read the new blog. Meanwhile, those readers more interested in recipes can stay put. *Makes me think of 'Under the Tuscan Sun,' a supposedly excellent book. Keep up your story on Just Hungry - it will be so much easier to follow! And congratulations on your move. We lived in Switzerland for 10 years, and flirted with the idea of moving to Provence more than once. We still might! Congratulations on your new house and new adventure! Please do blog about it here. I don't think there's a need for a separate Provence blog. Congrats on the move and hope everything and everyone settles in smoothly. I've enjoyed your blog and I think your new adventures in Provence should remain on this blog -- it's all you, all about the food and your relationship to it. Doesn't matter where you are. Thanks for all the work and time you do take to write and share with us! I look forward to vicariously living and renovating in Provence! Whether here on JH or on another blog, whatever works best for you. I would *love* to read about your life! I don't care if it's here or in another blog, so long as I know where to read about it. I suppose it would make more sense to keep it separate from this food blog, but like I said, I don't really care so long as I can read it. Congratulations! The view is fabulous! Please include your adventures on Just Hungry! One can always choose not to read if they don't wish to. I'd love to read more about your adventures on this blog! When I lived in Provence, I just fell in love with Vaison... so congratulations on your choice to live there, I'm very jealous! Best of luck! I don't mind reading about the new adventures here or somewhere else. I'd love to hear about life in France on this site. Good food isn't about where we are but about who we are and what we find to cook with!! So, please tell us all about it! Cheers! You write so well, I will follow you wherever you go. I am french (a US citizen now) and love to read blogs. I enjoy good, healthy recipes and good stories. Non-food posts once in a while are great and is a good break from food for me. However, if you are new to the site, it might be a bit confusing. 1. To clarify my earlier point, I'd be très heureuse to read about it either place. 2. As an aside, you might enjoy watching the BBC version of A Year in Provence, if you haven't already. It's quite good and faithful to the (excellent) book. In fact, Maki, I have it on DVD and could send you a copy if you like. I would love to hear about your new life in France on a a separate blog, but whatever is easier for you is okay with me! Congrats on the new place!! I have been following your blog very closely for almost a year now (after my trip to Japan last summer) and you've transformed my culinary habits! You might think that I'm not being objective here, as I'm actually from Valence (kinda between where you are and Lyon!!!) but I think it would be great to read from you and your new life here. And to prove my objectivity, here's a good reason: the search engine on your page is so efficient that when looking for a recipe, one should be able to find it easily anyway! I was living in Dublin, Ireland when I discovered your blog, and I now live in Singapore, where I can find even more Japanese supplies, and it's really fantastic to be able now to cook so many Japanese dishes. Thank you, thank you, thank you, and best of luck in your new start! Congratulations on your new adventure! This is a cross between A Year in Provence and Under the Tuscan Sun. I cannot wait for more updates. All the very best on this new chapter. I'm a crazy freak when it comes to organizing (so I have about 9-12 blogs lol) So I would make a whole nother blog however I'm very interested to read about your time in France no matter where you post it. Please write here instead of starting another blog. It makes the whole thing much more interesting. As readers we can make connections to the cooking post if you are writing about your home, kitchen, country side, market where you buy the produce etc.. as well as all the other fun stuff you write which makes life interesting and balanced. I really like reading your blogs separately - bento, cooking, japanese linguistics stuff... it would be better to have your adventures in life on a different blog also, I think. Alundra says that she likes that you don't have to scan through pages of images about children to get a recipie, and I feel like that is what you have done here for the most part, but if you start blogging about life adventures it will gradually (or not-so-gradually, depending on how much you have to say! hehe) become such, and will not be as focused on japanese food and cooking. My choice would be a separate blog. There are already too many ' starting a new life in France- books, blogs and other stuff and they are boring, I think. Your Japanese food blog is far more special. So keep it that way. Why are they so boring? Just curious! no kitchen? no problem! i cook on my lanai all the time using an Optimus No. 1 kerosene stove, a Punker marine alcohol two-burner stove, or an Optimus Hiker Plus w/custom burner head (running a kerosene, naptha mix) - you can find used stoves for very little at flea markets, thrift stores, or estate sales. Either way, it will be great to read about them. Personally, I don't think I could separate so clearly between food and non food items, so I'd probably keep them together, but again, that is personal. Maki-san, we love you so much - so, write! Just write! Food in its finest manifestations is an almost mystical synergy between time, place, soil (or "terroir"), air, light, feeling and history. Enjoy your new environs, while I enjoy the anticipation of what you will produce from it all and how you will change that place and how it will change you. Congratulations,on moving to provence.How wonderful. I'm happy to continue reading of your adventures on this blog - just hungry.An exciting new chapter for you, and for the blog. I would love to hear about your experience, here or in another blog. And as a provencal-bento-maker-student, welcome ! Bienvenue en Provence! I love Provence; I was just there a year ago for the lavender fields. Can't wait to read about your new adventures! p/s:Will be finishing my studies soon, if you are looking for cheap labor (Ha! Ha! ), just tell me where to sign up! It really depends on how it's done and how much content there will be. I really enjoyed the postcards from kyoto series...because it really gave me a sense of place, which to me adds richness to the food one is eating/making/trying to make as well. I also think one's surroundings really affects one's cooking and eating habits so in some ways even if you were to write about non-food related topics, it may still end up relating to it. Getting Japanese ingredients will be a challenge for you, perhaps a bit of fusion in the future! I am looking forward to your new posts and would love to get to know more about the Provence. I would love to hear about your new place in Provence. I wouldn't mind if you sprinkle it in here and there along with food-related posts. To answer your question about reading about your life... i'm just curious to what your life is like and i'd love to read about it here on this blog. I love reading your blog; you show me more interesting things about japanese cuisine and culture which i'm so interested in and curious about. Enjoyed your posting. Hoping to see more adventures you have in Provence. Hello! I think it'll be easier for readers to follow one blog instead of two, but for you, it might be better to have two separate blogs, each with its own focus? Hello and welcome in France ! 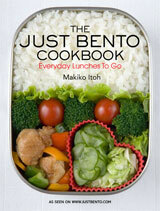 I just discovered your blog JustBento and from there JustHungry. I was a good surprise to learn you had just moved in my country. I hope to read more about your discoveries and adventures here. About finding workers in France in July and August, you might have a chance in July, until the 20th, if you're not in a too touristic place. In August nothing is done of the building or repairing kind if you're not doing it yourself, until at least the 25th. Then it's slowly getting back to work. It's sad because july & august are two great months for cooking. The vegetables & fruits are wonderful, so tasty, especially if you just get them from your garden. It's the season to make reserves (canned or frozen...). Did you think about buying a barbecue? If you are looking for japanese products there are several french shops which sell on the internet and deliver by post. Their websites are in french. There is also a shop in Paris (near Metro Pyramides) which specialized in mangas AND bento product (no shipping). I'd be interested in reading about your life in France wherever, although if it's here, perhaps you should change the name of the blog to "Not Just Hungry"! I've been an off and on reader of your sites for a while now and really appreciate the insights you have to share into Japanese food. I live in Osaka but my Japanese isn't great, so you're a wonderful source to help me understand the products I find in my supermarket downstairs. I don't mind personally where you post about your life in France, but have a professional recommendation for you. I work in search engine optimization. Your sites enjoy good rankings for many topics relating to Japanese foods, ingredients and recipes. This is largely because you have lots of links to your posts from other sites. Keeping your sites focused on these topics will continue to ensure those good rankings and all the great free traffic I'm sure you get from Google and other search engines. My recommendation for SEO is that as long as you are going to write about Japanese cooking and foods, keep it on this blog. The geographical location doesn't matter. However, if you are going to shift your focus to writing about French cooking or Mediterranean cooking, you would do better posting that on a new blog both to preserve your existing rankings and to encourage good rankings on topical keywords for those new topics. It's really challenging to get good rankings for a site with a sprawling set of topics. You're welcome to e-mail me if there's something I haven't made clear here. I feel like I've gotten so much free advice from you (although impersonally) that you're entitled to a bit of free advice too. It seems like living far away from access to Japanese/Asian shops might make your creativity more applicable to others who also have less access to those things. I live in Eastern Europe, love to read your Just Bento blog, but any time you reference tools or ingredients, I just have to sigh and say, yet again, that one's not for me. Its beautiful... Im so happy for you, Sensei... may you live there happily. Everything will surely be alright! It does make me wonder, how thousands of young people around the world dream about living in Japan, while your Mother, Japanese, doesnt feel very healthy there. I think its great if Sensei continues writing here, I so agree with many comments before! Definitely more about the house, the village and your new life! I would prefer to read it all right here. By the way, I am loving this new adventure. I, too, often day dream of doing the same thing! Can't wait to follow the journey. I agree with Athena. If a new recipe ties in with the rest of the blog then that would be much better. So I guess as we learn about your life in France adding in new recipes with your adventures would make it all the more interesting. By the way I love the view from your window! It looks beautiful. I'm green! Your new location sounds great, challenging but great. Only yesterday I discovered Just Hungry but already had plans to return. With the addition of Provence I'll return often. However, even if your life in Provence is a different site, I'll visit as Provence is one of my top 5 places in the world though I've visited only once. You are so lucky!!!!! The views are incredible!!!! I hope you have a great time in France!!!! I love Provence and I wish you all the luck and patience. I am reading your blog once a month and the format of it does not matter to me - the blog is always interesting to read. As for Provence - we spent a month last summer in Aix and this is one place where I would love to stay much longer. We spent one month in Bordeaux this winter - lovely city - they are planning to start fast trains to Paris from Bordeaux - 2 hours - unbelievable. Once again, please keep writing - your French experience, which in my mind is almost a synonym to food and art, might change my future :-). What a coincidence; we did nearly the same thing at the same time although we don't live in France just yet! We go there more or less every month though (from England). Our place is in the South West, Lot-et-Garonne. I'd love to read more about your new adventures, preferably in a new blog. Maybe I'm wrong but I think we have certain things in common and I'm interested to know more of your personal side. Please take care, don't work too hard.